The colder parts of the country have always been plagued by alcoholism and addiction. Long winters and very little work is the perfect recipe for heavy drinking. In many parts of America there is no authority present to control drunk driving, which means that in a place like Alaska a person can drink for many years without seeing many consequences, if any, from the law. More deaths are caused by addiction in Alaska than any other one thing. 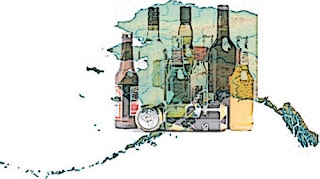 In fact, "nine of the 10 leading causes of death in Alaska - all but Alzheimer's disease - include alcohol, tobacco or other drug addiction as an underlying cause", the Juneau Empire reported March 15. David Driscoll of the University of Alaska Anchorage and colleagues examined seven underlying causes of death in communities in the north polar region of the globe. They determined that many deaths in Alaska are preventable with the aid of community programs and education about the dangers of drugs and alcohol. Smoking is a leading cause of many health problems including cancer, heart disease and stroke. Alcohol use, aside from being highly addictive, can contribute to serious liver and pancreas problems, as well as, influence the onset of diabetes. There are many cases of people committing suicide while under the influence of alcohol and/or drugs. Cold, dark and depressing climates in conjunction with drugs and alcohol can be a recipe for disaster - many people simply lose the will to continue living. Unfortunately, places like Alaska, Montana, and northern Maine have very limited education due to the lack of funding. It is very difficult getting teachers out to the middle of nowhere to teach a few kids. Many kids are home schooled and are influenced heavily by the actions of their parents. If a child is around a parent all the time who happens to have a drinking problem, the child will without a doubt adopt some of that parent's behavior. Without community outreach programs and better schools in rural areas it is unlikely this pattern of addiction related death will change.